30ml = 1 of your 5 a day! Active Edge CherryActive Concentrated Juices are 100% natural and packed full of antioxidant-rich Montmorency cherries. They contain no sweeteners, preservatives, flavourings or added sugar. Each 237ml bottle contains the juice from approximately 750 Montmorency cherries. The extra mile. That`s how far Active Edge go to ensure they optimise the quality of their products. It starts with a specifically chosen variety of cherry, the Montmorency, which has an exceptional nutritional and taste profile. They only partner with the most experienced specialist farmers, meaning that not only is their fruit lovingly grown, but they can manage the moment of harvest, with the fruit being picked in its prime, packed full of nutrients and flavour. The cherries are then pressed and concentrated, avoiding excessive heat to protect the goodness, before cold filling into bottles. The result of this process is a 100% concentrated juice with a superior nutrient content and flavour. Active Edge products are chosen by health-conscious, active consumers, including top professional sports teams and athletes, all of whom appreciate the benefits of their unique approach and dedication to quality. 100% Concentrated Montmorency Cherry Juice. Mix 30ml (2 tbsp) with 240ml (regular glass) water. Also add to smoothies, natural yoghurt or post-exercise shakes. To keep in optimum condition, store refrigerated. Once open, keep refrigerated and consume within three months. 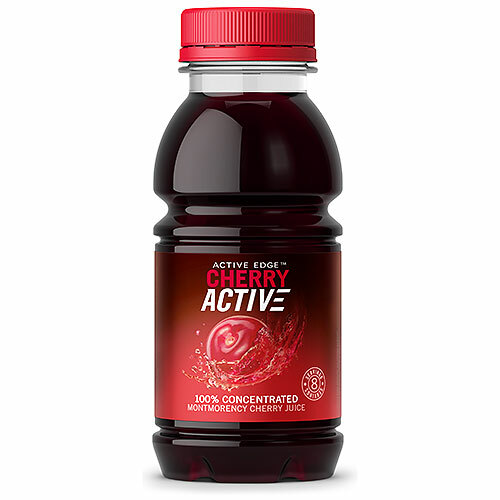 Below are reviews of Active Edge CherryActive Concentrated Juice - 237ml by bodykind customers. If you have tried this product we'd love to hear what you think so please leave a review. Excellent product! Great help for my arthritis and enable me to sleep better too. Totally addicted to this. Healthy and also so thirst quenching in this hot weather, brilliant with soda water and a dash of cider vinegar. Only taking for last 2 weeks but I am enjoying it. I'm hoping it will help ease aches and pains. Also I do seem to be sleeping better but strangely similar to another reviewer I'm dreaming a lot. Pleasant tasting, could soon get through one bottle, but better value than trying to buy the fruit itself. The "tart" variety is the one in studies, unlike some other firms who sell juice. I have been taking CherryActive now for about 8 months. I am taking it to relieve gout and I have to say I have not had any attacks since taking it. Can't fault it! After having trouble sleeping through the night, I have been taking CherryActive for about 4 weeks now and are sleeping right through the night, although the CerryActive seems to be making me dream quiet a lot.